Our training is fuelled by best practice from brands that have achieved excellence in digital marketing, digital strategy and digital media. 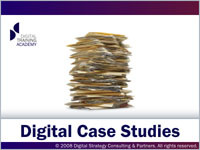 Agencies from any country can submit case studies for the Digital Training Academy to consider. On this page you'll find a few of the digital marketing case studies we've recently accepted and we hope you enjoy learning from them. Each represents an aspect of best practice we've found useful when teaching digital marketing, and if you're joining us for a Digital Training Academy, then ask about case studies in your sector. You can do this online through our online submission form or by email. If you'd like to submit examples of your work then email them into CaseStudies@DigitalTrainingAcademy.com and after an initial review we'll be in touch if we feel they can be used to support learning goals. There is also an online submission tool, here: http://www.digitaltrainingacademy.com/submit. By sending us a case study you agree we can use it in training, conference speeches, book chapters and reports and other media. You need to be confident you have the necessary rights and permissions from partners or clients to be able to do this. Case studies cannot be restricted to one particular course so we can only accept material which can be used in any aspect of our training. However, if youd like us to withdraw a case study at any point, then we can do this within two weeks. Click here to browse our entire library of case studies by topic. Baby Supermall recently worked with Google to run a targeted AdWords paid search campaign, targeting mothers. This video case study outlines how the baby retailer linked analytics to search with attribution modelling to generate tens of thousands of dollars in additional sales every week." Suttons Seeds worked with SLI to implement learning site search technology to help visitors find products they wanted. This case study looks at how the garden equipment and seeds supplier got a 112% higher conversion rate for site search users with learning search. It’s true that a life without mistakes is a life not truly lived- but we can be sure the Kellogg’s marketing department could have lived without promising to feed hungry children in exchange for retweets. As 2013 draws to a close, we look as some of the biggest digital marketing fails of the year, from the horsemeat scandal and HMV’s live-blogged mass sackings to Facebook’s ‘Home’ flop and the Xbox ‘deal with it’ Twitter outburst. Read on, learn from the mistakes and hope your team doesn’t make the list in 2014…. During 2013, Aviva overhauled its email marketing strategy with the help of Alchemy Worx. This case study looks at how the car insurance firm’s counter intuitive 'send more email' approach generated a 48 per cent rise in the number of quotes requested, as well as seeing a 4-fold increase in click-throughs. Lay’s is running a second campaign for its crowdsourced “Do Us A Flavour” ads, this time incorporating Instagram and Twitter, as Pepsico’s crisp brand looks to boost its reach on smartphones and tablets. Hermès launched a new Facebook video campaign to promote its winter catalogue. This case study highlights how the luxury clothing retailer used an engaging story told through social media to boost sales. This case study highlights how confectionery firm Jelly Belly used SLI Systems to improve its user experience and profitability. By optimising site search and SEO, SLI helped Jelly Belly see a 33% increase in site conversions and a 10% increase in average order value. By using SLI’s customised search results pages and adding those links to email campaigns, Jelly Belly realised an 85% better open rate for emails. Personalising and testing the online customer experience can have lasting effects on customer engagement, conversion funnels and revenue. Moreover, in the competitive online travel sector, the effective marriage of a data-rich environment and powerful customer experience optimisation tools is helping travel companies provide customers with more personalised online journeys. This case study shows how airline Easyjet optimised its web presence in partnership with Maxymiyser attracting over 370 million visits in 2012. Samsung has been named as the social brand of the year according to Unruly after amassing 7.3 million shares of its videos. The brand rose seven places from last year to take the top spot, while Geico came in second with 4.9 million shares, ahead of Dove at 4.5 million and Pepsi at four million. This case study looks at how Samsung made smart use of its video assets across YouTube and beyond. Amid the Harlem Shakes, singing astronauts and twerking fails, 2013 was another bumper year for viral video marketing case studies. From the emotionally powerful (Dove’s ‘Sketches’ and Skype’s ‘Born Friends’ ) to the downright dirty (Durex’s ‘Fundawear’ and Kmart’s ‘Ship My Pants’) there’s been a wealth of great online marketing ads that got people sharing in droves. This year also saw the debut of Twitter’s Vine videos - with Lowes and Tide pioneering the 6-second format with smart and economical executions. With the help of an innovative laser-print technique, Fyffes managed to print six different comics on banana skins. This case study looks at how the fruit brand managed to get kids to ditch sweets for bananas. With the latest John Lewis' Christmas ad hitting both TV and YouTube over the weekend, just how did the retailer manage to achieve such high-profile anticipation and social media comment for a seasonal campaign? This case study from the Institute of Practitioners in Advertising (IPA) interviews some to the people behind the previous festive campaigns to see how the department store chain managed to eclipse rivals such as Marks and Spencer and Debenhams to position itself as the premier shopping destination for Christmas in the UK. The third annual Debenhams Beauty Club Awards received a 2,370% increase in traffic due to a mobile-optimised campaign, resulting in a record 5,000 new signups the retailer’s loyalty card. This case study looks into how the retail, working with agency Steel London, made smart use of mobile to get people clicking. T.M.Lewin, the apparel brand, has seen a dramatic increase in revenue in its men’s suit category following a website revamp by eCommera, the decision intelligent commerce company. The focus of the revamp was influenced by eCommera’s online decision intelligence tool DynamicAction. In September 2013, Persil worked with TMW to support the launch of its new ‘Small and Mighty’ range. To support the launch of the new Persil created ‘Be Mighty’, a digital campaign featuring a series of animated and interactive online story books for children. This case study looks at how the detergent brand made smart use of its brand image and target audience to come up with a cutting edge digital campaign that delivered a lasting impact on consumers. As part of its hugely successful ‘Volvo Trucks’ stunt series on YouTube, the Swedish auto maker hired the ‘Muscles from Brussels’ himself- Jean Claude Van Damme- to perform an eye-watering stunt between two moving heavy vehicles. The new advert, which aims to promote Volvo Trucks’ new dynamic steering system and has become a YouTube hit, garnering over 25m views since its launch. As part of its ‘Stay Together’ series, this video from Skype tugs at the heart strings, telling the story of a long-distance friendship between two teenage girls, from the US and New Zealand, who were both born with one arm. The emotional impact of the ad has led to over 2 million views so far. In its most ambitious campaign yet, Samsung’s latest Galaxy viral video pitches football star Lionel Messi against a horde of invading aliens. The campaign is only just kicking off, with more big players set to join the ‘Galaxy 11’ in what looks like a big budget sci-fi version of ‘Escape to Victory’. Twitter’s new 6-second Vine video platform proved a big hit this year .If used correctly, Vine offers a quick yet extremely effective way for brands to reach wider, socially engaged audiences. And as one of the fastest growing mobile apps in the world, this means enormous potential for marketers. We look back at some of the best, starting with Lowes' ingenious visual tips that make DIY seem fun (well…almost). To keep up with the US tradition of toilet papering your house on Halloween, snack brand Cheetos teamed with Google maps and Street View to recreate the experience online (without risking vandalism charges). The app works by letting users enter a chosen address and creating a toilet paper "bombing" experience using Google Earth and Google Streetview. Users can then share the results via social media. Of course, the site has to come with a warning that Cheetos doesn't condone actual toilet-papering... only the digital kind. Pepsi is running a YouTube series capturing the life of an old man with seemingly supernatural basketball skills, attracting nearly 40 million views with brand engagement that extends far beyond a 30-second TV commercial. US snack brand Diamond has launched an engaging (but also bizarre) campaign "Diamond Nut Fantasies". Recognizing that the average cook rarely get the praise and appreciation they deserve, this series of YouTube spots plays with the idea that baking them a treat with Diamond Nuts could help people transform to be the husband, neighbour, child and boyfriend of their dreams. This series of YouTube spots were based on research that showed that Diamond Nut customers--two-thirds of whom were women--bake in large part not just because they care, but for the praise and compliments they get. So the agency imagined what it would be like if everyday people gushed with appreciation for the food they make. The advert imitates Old Spice's classic ‘The man your man could smell like’ ad, with an engaging walk through a myriad of scenes celebrating the fun and frivolous side of a good cup of tea, whilst showcasing the soothing effects of a proper brew. Yorkshire Tea has taken to YouTube, with an epic song celebrating the virtues of the old fashioned cuppa, incorporating zombies, brass bands and even the odd Skyrim reference. To boost engagement, the YouTube ad ends with a call to action getting the viewer to click through to a behind the scenes video, along with links to the Yorkshire Tea homepage and the company's official Facebook page, both of which continue the ‘Tea Song’ branding. To coincide with the new academic year, Unilever's Pot Noodle offered one student the chance to have their tuition fees for the next year paid for them, as part of a new Facebook ‘Scholar’ campaign. The winner was given everything they need to live the Uni lifestyle including Pot Noodle-branded t-shirts, trainers, bed sheets, condoms, a year’s supply of Pot Noodle and a “legendary” party. A Dalston corner shop gave its regulars an uplifting and unusual retail experience when it was transformed into an all-singing, all-grooving musical instrument by Red Stripe lager. This case study looks at how the Jamacian lager brand made smart use of in-store advertising and viral marketing to get 1 million YouTube views.